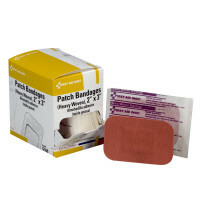 Heavy Duty Woven Fabric Bandages For Flexibility and strength, our Heavy Woven Patch Bandages, Knuckle Bandages, Adhesive Bandages & Heavy Woven Fingertip Bandages will do the trick. Our Heavy Woven bandages are water and grease-resistant bandages are made from a comfortable, heavy-duty fabric that allows skin to breathe for faster healing. 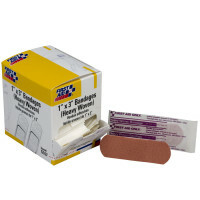 Flexible and easy to remove without sticking to the wound - Great for construction, for use when you work with your hands, or in situations where an injury is likely to get damp or dirty. 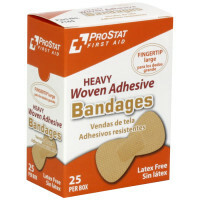 Heavy Woven Bandages - in Patch, Mini Patch, Knuckle, Standard 1", and even Fingertip! 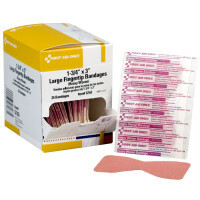 Bandages for construction, warehouse, shop or other heavy use? 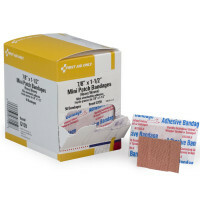 Our heavy woven bandages are ideal for a variety of minor cuts, abrasions and puncture wounds. They are ventilated to help aid in the natural healing process so that the skin can breathe for faster healing. 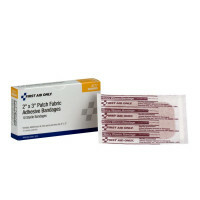 The uniquely designed heavy duty flexible fabric is designed to stretch when you stretch while the strong adhesive still holds the bandage in place.